Color Protecting Conditioner is mild formulation that longtime locks moisture, repairs cuticle and enhances hair elasticity. 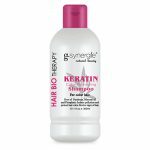 This formula is safe for chemically and color treated hair and free of Parabens, Mineral oil and Phosphate. Leaves hair with fresh and unique feeling.